Nationality: French. Born: Pierre-Jules Laudenbach in Paris, 4 April 1897. Education: Lycée Montaigne and Lycée Henri-IV, Paris; studied with George Berr at Conservatoire National d'Art Dramatique, Paris. Military Service: 1916–19—service in army; 2nd lieutenant. Family: Married 1) Rachel Berendt (divorced); 2) the actress Berthe Bovy (divorced); 3) the actress Yvonne Printemps, 1934. Career: 1912—stage debut at Théâtre Réjane in L'Aigrette ; 1915—debut with Comédie Française in Le Jeu de l'amour et du hasard ; film debut in France d'abord ; 1920—first London stage role, with Comédie Française, in Le Misanthrope ; 1926—resigned from Comédie Française; 1931–36—co-starred with Raimu in Marcel Pagnol film trilogy Marius , Fanny , and César ; 1934—replaced Noël Coward in Conversation Piece , came to New York with show; 1937—co-manager with wife Yvonne Printemps, and lead actor of Théâtre de la Michodière, Paris; 1972—last stage play, Roussin's La Claque . Awards: Best Actor, Venice Festival, for Monsieur Vincent , 1947; Prix Féminin du Cinéma, 1949. Died: In Neuilly-sur-Seine, France, 9 January 1975. Je suis comédien , interviews with Albert Dubeux, Paris, 1954. Pierre Fresnay , with François Possot, Paris, 1976. Dubeux, Albert, Pierre Fresnay , Paris, 1950. Ford, Charles, Pierre Fresnay: Gentilhomme de l'ecran , Paris, 1981. Beylie, C., "Pierre Fresnay," in Ecran (Paris), March 1975. Passek, J.-L., "Nécrologie: Pierre Fresnay," in Cinéma (Paris), April 1975. Ford, Charles, "Pierre Fresnay (1897–1975)," in Anthologie du Cinéma (Paris), October 1976. Malaparte, Curzio, "Cinema, dall'anti teatro al teatro nuovo," in Cinema Nuovo (Bari), January-February 1988. Hällström, Raoul af, "Pierre Fresnay: Elokuvan elegantein näyttelijä," in Filmihullu (Helsinki), no. 2, 1995. Pierre Fresnay was interested in being an actor from an early age, and was helped in his ambitions by his uncle, the actor Jules Dietz, a member of the Comédie Française (and a film actor under the name of Claude Garry). Fresnay made recitations on family occasions from the age of five, performed in a vaudeville of Jean Cocteau, and made his stage debut at 14 in a small part with the actress Réjane at her own theater. With his uncle's help, and because of the mobilization of several actors during the war, Fresnay was able to make his debut at the Comédie Française at the age of 18, and to keep his position there after the war was over. Though he resigned from the Comédie Française in 1926 over its preferential treatment practices, and was fined for breaching his contract, his years there had confirmed his interest in stage acting. He continued to act on the stage, and from 1937 to co-manage his own company, until the end of his life. Fresnay's 60-year-long film acting career began with small parts in the 1910s and 1920s. His film "break" came with the arrival of sound, and his being cast in the title role of Marius . He had played the role in the stage version, though his co-star, Raimu, and even the author, Maurice Pagnol, had expressed doubts concerning Fresnay's temperament and his over-distinguished theatrical demeanor. Yet the apprehensions proved unfounded, the play was a popular and critical success (reaching a record number of performances), and the film was also highly acclaimed. The sequels, Fanny and César (directed by Pagnol himself), were equally well-received. Fresnay's versatility was proved by the different roles he played in Ame de Clown , The Man Who Knew Too Much (a French spy), Sous les yeux d'occident (the counter-revolutionary Rasputin), and Cheri-Bibi (a convict). But what really solidified his film career was his role as a French officer in Renoir's La Grande Illusion . 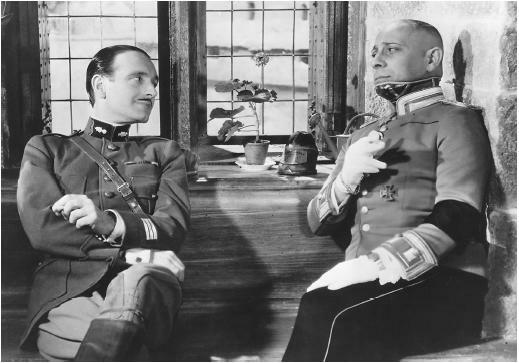 He and von Stroheim represent two mutually antagonistic countries at war, yet they find mutual sympathy for one another on the basis of a common social class. In another group of films, Fresnay portrayed detectives: Puritain , Dernier des six , and L'Assassin habite au 21 (in the last two of which he played Inspector Wens, created by Georges Simenon). Another group of films, in which he was cast in historical biographies, began with Monsieur Vincent , in which he played Saint Vincent de Paul; he played the pioneer flyer Didier Daurat in Au grand balcon , the composer Offenbach in La Valse de Paris , Schweitzer in Il est minuit, Docteur Schweitzer , and the scientist Henri Fabre in Monsieur Fabre . His film work in the 1950s and after is generally thought to be outdated, but he made such interesting films as Le Défroqué and Les Évadés , and continued to work on television until his death.